The Bogen 680B (Manfrotto 3249B) Monopod is a great value monopod. For a very low cost, you get a well-constructed four-section monopod with a heavy weight rating. The "B" is for black. The Bogen 680B (Manfrotto 3249B) Monopod reminds me of a leg from the Bogen/Manfrotto 3021B Pro Tripod. Fully round aluminum construction with flip-locks. Fully extended (60"), the Bogen 680B (Manfrotto 3249B) Monopod is tall enough for me (6'), but there is not a lot of room to spare. When resting the monopod on the ground at the same height I am standing on, the height was adequate. If I were standing on a step above the monopod, I would need to crouch down a bit to use the Bogen 680B (Manfrotto 3249B) Monopod. The Bogen 349 (Manfrotto 3449) Carbon-One Monopod and the Gitzo G1588 Mountaineer Mk2 Carbon Fiber Monopod both extended longer. The Bogen 680B (Manfrotto 3249B) Monopod retracts to a relatively small 20 inches. 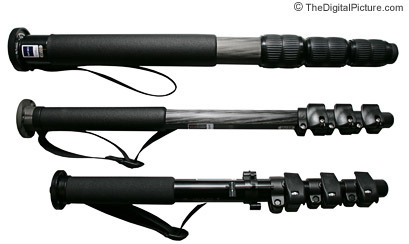 The benefit of a 4-section monopod is that they become rather compact for transport and storage. Aluminum has some disadvantages to carbon fiber in monopod construction. The primary disadvantage is weight. Although made of cost effective and relatively light aluminum, the Bogen 680B (Manfrotto 3249B) Monopod is not much different in weight (1.69 lbs) than most other monopods of this quality. Another aluminum disadvantage is the stealth factor. Aluminum makes far more noise when hit by branches during a stalk on elusive wildlife. By the way - the flip-locks will send all wildlife in the area into flight when closing - they are very loud. The smooth surface of aluminum is also reflective of sunlight. Yet another Aluminum disadvantage is its readiness to transfer heat in cold weather. A padded/insulated hand grip is provided on the Bogen 680B (Manfrotto 3249B) Monopod. Aluminum can also dent if subjected to abuse. Altough I prefer flip-locks on my tripod, I prefer twist locks on my monopod. Flip-locks are (basically) either locked or unlocked. I like to extend all but one section and snug the last one to a length a bit longer than I expect to need. I then push the last section down to the height I want and finish the tightening. The flip-locks on the Bogen 680B (Manfrotto 3249B) Monopod require a very firm squeeze to close - and the resulting noise is noticeable. But they hold tight. Although probably not a big deal for most, the foot on the Bogen 680B (Manfrotto 3249B) Monopod is less grippy than the foot on the Bogen 349 (Manfrotto 3449) Carbon-One Monopod and the Gitzo G1588 Mountaineer Mk2 Carbon Fiber Monopod. If you have a slippery/smooth surface to work on, this might be important to you. A rotating and adjustable handstrap is provided on the Bogen 680B (Manfrotto 3249B) Monopod. Mount a Wimberley Quick Release Plate and possibly a Bogen 3232 Swivel Tilt Monopod Head the Bogen 680B (Manfrotto 3249B) Monopod for an excellent setup. Again, the Bogen 680B (Manfrotto 3249B) Monopod is a great value monopod with a heavy weight rating.